Last month, country music sensation JO DEE MESSINA gave her fans the opportunity to become backers on her new album through Kickstarter and even went as far as to let them choose the songs for the upcoming project. Now, in yet another bold effort to involve her growing fan base, she's letting the public pick the single! Jo Dee Messina is putting the finishing touches on her newest album, and she’s reached the part of the process in which a radio single must be selected! Jo Dee has expressed to fans that she wants to introduce the album with a fun, up-tempo song. She’s performed new material in recent live shows and is now relying on concertgoers for feedback via social media on which song they think should be the album’s first single. “Woman’s Rant” and “Peace Sign” are both strong contenders as they have the strong empowering lyrics you would expect from Messina. 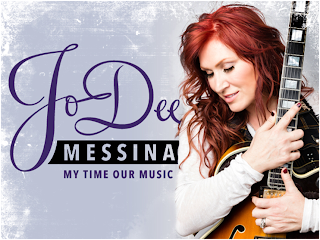 Now fans can listen to a portion of each song on the official Jo Dee Messina website and cast their vote on which one they want released first! “For years I’ve had people asking for certain songs to be released, but had no control over the singles. Now that have the opportunity, I want to let the fans to choose the single. After all, they made this record possible—it’s their album!” said Messina. Go to the Jo Dee Messina Facebook page or JodeeMessina.com to listen and vote for the song you think should hit the airwaves. Let your voice be heard!